Nancy and Christian Schneider live in the Holly Lake Mobile Home park, where they haven't had electricity in their home since Hurricane Irma struck Florida over a week ago. At the Holly Lake Mobile Home park some blocks have electricity while other don't. 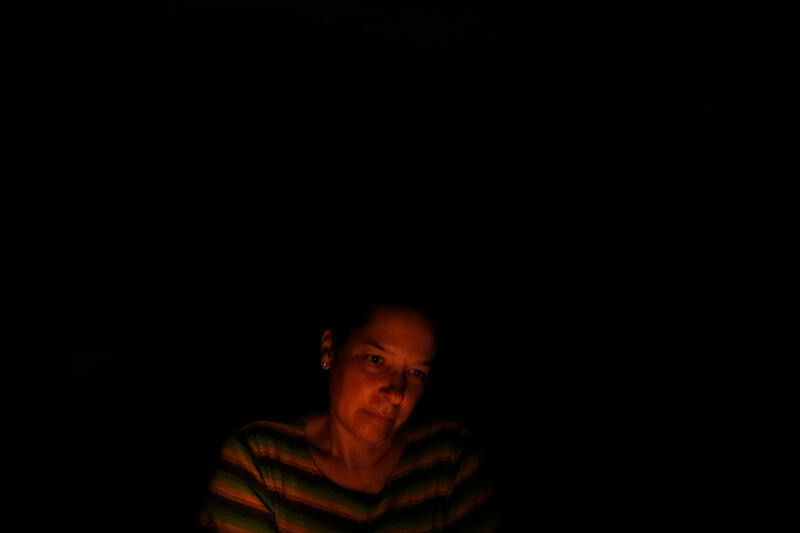 Nancy sits in the kitchen lit by one candle deciding whether to try and make food in the dark, or just go to bed. Generators hum loudly through the night at Holly Lake and provide a small amount of light as seen in the neighbors window. In the Holly Lake Mobile Home park where Nancy and her husband Christian live, there are blocks of houses that have power. She says it's "disheartening" that "less than a football field away there's power, but we're here standing in the dark." 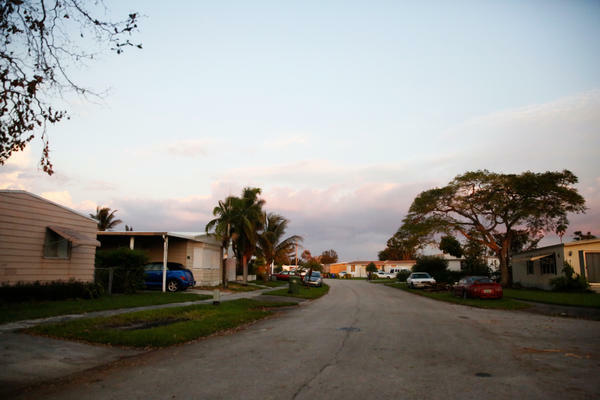 Their neighborhood in Pembroke Pines, north of Miami, backs up against the Everglades. When we walk a block from their house — to check on their older neighbors — it's clear that the combination of heavy winds and tall trees have done some damage to the power lines. The heat is their biggest concern — temperatures in South Florida have been in the 90s this week. A neighbor lent them a generator a few days ago — so they've been using that to power their fridge and fans — bringing the temperature down to the high 80s from above 100. Christian is thinking he might unplug the fridge for a few hours so he can watch some television — maybe catch up on the news they've been living, but not watching, for the past week. "You don't realize until you lose electricity that that basically runs your life, you want to make coffee in the morning. You can't. No laundry, no hot showers," Nancy says. "It's like living in the 1700s." 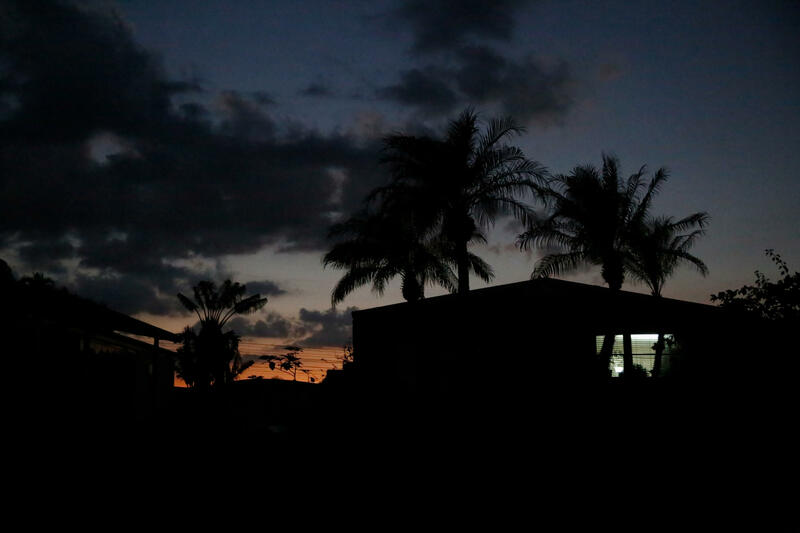 Every morning they start the day the same, with a call to Florida Power and Light. On a recent visit, we sit at their kitchen table — lit up only by candlelight and try the number again. There's no update. Maybe tomorrow, Nancy says with a sigh. FPL said in press conferences last week that residents do not need to call in outages because their system is equipped to detect them. The company also says it prioritized restoring power to critical functions like hospitals and will now "keep working through the night until we're done." "So many unknowns, and to me that's the hardest part — not knowing," Nancy says. One thing she does know: Broward County schools are reopening this week. 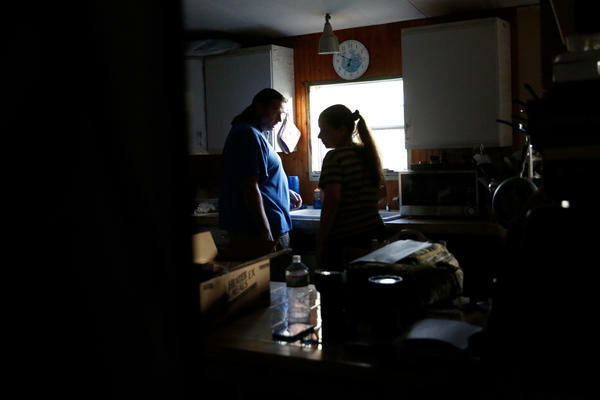 Nancy is a special education teacher, so even without power at home, she has to report to work. "I guess I'll just be getting ready for work in the dark," she tells me. She walks over to the bathroom with a flashlight, to see if she'll have enough light to do makeup in the morning. She holds up the light to her face. She's not convinced — laughing that she looks like she's about to tell a ghost story, rather than put on some mascara. The couple hopes this is their last hurricane season — they've just bought a big old house in Western Pennsylvania. They think the biggest weather they'll have to deal with now is some snow — and really, after Andrew, Wilma and Irma — Nancy and Christian aren't worried. After all, they tell me, snowstorms don't even have names.